“Jety-Oguz” in the Kyrgyz language means “Seven Bulls”. The name derives from its majestic yellow-red sandstone and gravel stone rocks, which bear a strong resemblance to bulls’ heads. These remarkable rocks, set against the background of bright blue sky, dazzling white snow-capped summits and slopes adorned by coniferous woodlands leave an unforgettable impression. 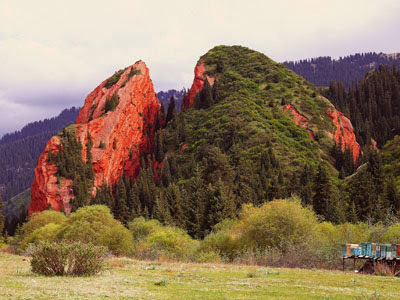 Jety-Oguz village is situated about 28 kms southwest of Karakol town. The wide valley of the Jety-Oguz river starts just behind the village. Gradually, the valley becomes narrow and 15 kms to the south of the village, it turns into a mountain canyon. From both sides the river is framed by sheer walls of red sandstone. The rock “Broken Heart”, which dominates the left bank of the river, is exceptionally stunning. There is a beautiful legend about how the Seven Bulls rocks derive their name. Once upon a time two mighty khans established their headquarters at the foothills of Terskey Ala-Too mountain range. One of the khans had a well-graced wife: her beauty was compared to the beauty of the moon. The other khan, who was cruel and jealous, kidnapped this beautiful woman. This advice greatly appealed to the cruel khan. He decided to hold a grand gala and invited many people from different clans. As befitted a gala, the khan ordered seven bulls be slaughtered. When the last bull was slaughtered, he plunged a dagger into the heart of the beauty. Blood spurted from her heart and sprinkled the rocks (that is why the rocks of the locality are red). At that very moment streams of boiling water flooded the valley where the scene took place. The cruel khan and his entourage were drowned in the boiling water. The streams carried aside the seven slaughtered bulls and they turned into seven blood-red rocks. Thenceforth, the locality has been called Jety-Oguz (Seven Bulls). An extraordinarily picturesque valley stretches behind Broken Heart rock. The western part of this valley is almost entirely occupied by a health resort, developed in Soviet times. (see below) From the opposite side, the resort is embraced by a conifer forest, which covers the northern slope of the Kok-Bel’ Ridge. The area offers great opportunities for exploring. Visitors can hike to the Ak-Sai area. To reach Ak-Sai, walk through the ravine that starts immediately behind the sanatorium. Closer to its end, the ravine gives way to the pretty valley of Kok Jayik (Valley of the Flowers), which is splashed with motley flowers in spring. 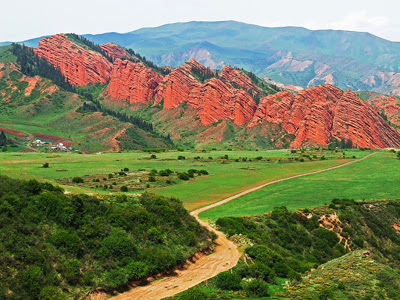 Holidaymakers also call this place Kumys Valley, named after the Kyrgyz national drink made from fermented mare’s milk. The valley also holds an attraction for mushroom gatherers: here are glades of edible fungus. The opposite bank of the river is bordered with woodlands that nestle on the sides of the slopes, above which the snow-capped giants of the Terskey Range tower. In the middle of the valley, a majestic mountain can be observed; it is called Oguz Bashi (Bull’s Head). This mountain has two summits, the highest point of which is 5170 metres. In its upper part, an impregnable rock wall blocks the valley. The sanatorium (health resort) is located at the northern slope of the Terskey Ala-Too range 2200 meters above sea level. Small hollows around “holy” springs are evidence of the therapeutic usage of hot, mineral waters for bathing from time immemorial. Russians conducted the first surveys of the hot springs in 1910. The same year, at the initiative of the Red Cross, wooden bathtubs and a simple wood-framed hygienic centre were built there. Mostly military officials and local men of high standing used these rustic facilities. The development of the sanatorium started in 1937, when the Kyrgyz health resort administrative department was formed. The mineral waters of Jety-Oguz spa are a unique combination of mineralization, radon content and chemical composition. They are used for balneotherapy, therapeutic irrigation (lavage) and therapeutic drinking treatments to treat a diverse range of illnesses. Mud treatments are also available. Guests generally stay between 10 and 20 days for a full curative treatment. (Note - it is not possible to visit the sanatorium for a "day spa"). Jety-Oguz' mountain location, dominated by conifer forests, makes it very special. The area is relatively windless with insignificant fluctuations in temperatures and air humidity. The forest also has a positive effect on the body’s nervous system. 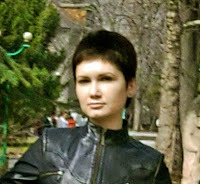 The resort was famous in Soviet times and continues to attract guests from Russia, Central Asia and beyond. In 1991, an important meeting between Boris Yeltsin and Kyrgyzstan’s first president Askar Akayev took place in Jety-Oguz resort. Jety-Oguz offers a variety of alternatives not only for ardent admirers of nature, but also for hikers and mountaineers. 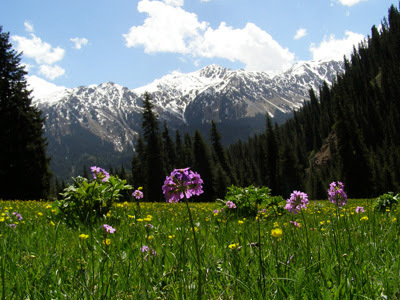 On an Uzbek Journeys tour to Kyrgyzstan you visit Jetz-Oguz, enjoy a picnic lunch and a chance for hiking in the Valley of the Flowers.